After researching the lint removers on the market, I chose the Conair Fabric Defuzzer as my first line of defense against lint. It was time to invest in the best lint remover that could make things look neat and like new with all lint building up when my dog starts shedding hair. Plus, my family’s knit clothes tend to pill up with normal wear, keeping my home and clothes clean could be a challenge. One of the highlights of the Conair Fabric Defuzzer is that I can adjust how close it shaves depending on the material I’m treating. If I am removing pills from a tightly-woven garment like a sweatshirt, I can give it a close shave. If I am cleaning something with a looser weave, I can increase the distance of the blades from the material so that I don’t cause damage. Just a turn of the head changes the setting. All the lint it removes collects in a compartment under the blades. I can clean two or three pieces of clothing without stopping to empty it. The only problem is that I can’t see how full it is because the lint catcher isn’t transparent. On the other hand, the Conair Defuzzer is comfortable to hold and use. Its shaving head is large enough that it clears off lint quickly so I don’t need to spend a lot of time repeating passes over a garment. I like that it runs off two AA-size batteries which are inexpensive to buy and are used in other household items I have. That way I’m not wasting money to keep the Defuzzer working. One thing I noticed is that fuzz gets wrapped around the blades. Once a week I pull apart the Defuzzer and give it a good cleaning. I want it to keep working well because I use it a lot. Besides the Conair Fabric Defuzzer, there was another fabric shaver that I liked. I’d like to describe it for you below. 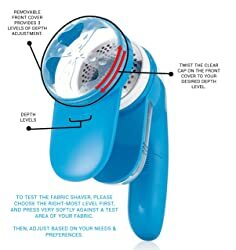 There are three features that I liked about the Deneve Fabric Shaver. One is the fact that it has six blades instead of three. Two, it has an adjustable cutting depth like the Conair so you can shave both loose and tight weaves without worrying about damaging the material. And three, the lint collector compartment is transparent so you can see how full it is. With all those benefits, you may wonder why I chose the Conair over the Deneve. Like the Conair, the Deneve uses two AA batteries to run. The battery compartment lid is right under the handle. That’s where I found the big downside to this saver. It’s hard to use it without accidentally opening the lid and dropping the batteries. It’s also not as comfortable for me to hold and use because the handle is smaller. In the battle against lint, pet hair, and fuzz in my home, I’ve also investigated using other methods of lint removal like the ones below. Scoth-Brite Lint Rollers are a staple product in many of my friend’s homes, especially when they have pets. The adhesive on the roller sheets is just enough to pick up lint without making clothing sticky or damaging fabric. You can use these rollers for furniture as well as clothes and even upholstery in vehicles. Their 4-inch width cleans a large swath with each pass. Each used sheet tears off neatly so you can get to a fresh one below it. There’s no cardboard roll in the middle so you don’t end up with additional garbage when you finish with the roller. The main downside to the Scotch-Brite rollers is that they are disposable. Yes, you can recycle the plastic handles but you’ll always need to purchase more rollers. The best deal I’ve found is to buy a multi-pack of 5 rollers that have 95 sheets each. It’s a better price per roller and saves on shipping, too. Plus, everyone in the family can keep their own roller in their closet. 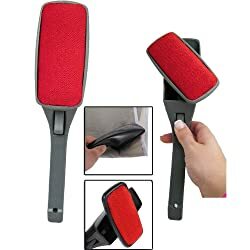 Although the Scotch-Brite rollers are convenient to use, these Magic Lint Brushes are infinitely reusable. They should be good for years of removing lint, hair, and fuzz. I’ve chosen these as a simple way of controlling pet hair in my home. Since they come in a two-pack, I can leave a brush in two different places at home, ready to use. The velour head is safe for use on any material, and it’s reversible. Just make sure you’re brushing in the correct direction against the grain so you pick up lint and hair instead of spreading it. When you’re done picking up lint, wipe your hand across the brush with the grain of the velour. That will clean the brush for its next use. All of these lint removers have great features. It just depends on what you want for your home. The Conair Fabric Defuzzer and the Magic Brushes are working very well for me. Since lint and pet hair was a big problem for my family, I wanted a solution that was easy to use on a regular basis. I researched several products and read many user reviews. I determined that there were certain criteria that would help me choose the best lint removers for my home. I hope that these features can help you select the ones that best meet your needs, too. My number one consideration was finding a lint remover that would not damage either clothing or furniture. The fact that the Conair and the Deneve shavers can be adjusted to different blade heights was a big part of why I liked them. The Magic Brushes and Scotch-Brite rollers don’t damage fabrics either. Next, although all of these lint removers are inexpensive, I wanted something I could use for a while without having to replace it. Of course, if the lint remover took too long to do its job, no one in my family would take the time to use it. It needed to clean fabric well without needing a lot of effort. Finally, along with the idea that a good lint remover shouldn’t need a lot of effort to use, it also shouldn’t need a lot of work to clean and maintain. I wanted tools that would be ready to use again right away. Having lint removers for my home makes caring for my family’s clothing, the car, and the furniture a lot easier. They make many types of fabric look clean and like new again. I’d like to review for you what I liked about each lint remover to help you choose the best ones for your home. The Conair Fabric Defuzzer has three blade height settings. You can clean tightly-woven cloth with the blades close to the fabric, or raise the blades to remove fuzz from loose weaves. You’ll need to empty the lint catcher and occasionally clean the blades. It runs on two AA batteries. The Deneve Fabric Shaver is very similar to the Conair Defuzzer. The main difference is that the lint catcher is transparent so you can see when it’s getting full. Be careful not to knock off the battery compartment lid while you use the shaver. If you have fabric that has pilled up, take a look at the Conair Defuzzer and Deneve Fabric Shaver. They can make your clothing look like new because they will cut off pills and make the cloth smooth again. You’ll need AA batteries to operate them. Scotch-Brite Lint Rollers have adhesive tear-off sheets. They are not reusable, but the roller itself is recyclable. The sheets are gentle enough to use on all fabrics. The Magic Brushes from ATB use a stiff velour head to pick up lint. Be careful to brush in the correct direction to pick up instead of lay down fuzz. They are reusable and need to be cleaned after each use. If you are dealing with lint and pet hair, both the Scotch-Brite Lint Rollers and the Magic Brushes will help you keep your home and clothing clean. While the Magic Brushes are reusable, you’ll need to clean them. The Scotch-Brite rollers have disposable adhesive sheets, so buying a multi-pack may save you money and help you keep them on hand where you need them. I love looking at the neat appearance of my family’s clothes and furniture after I’ve removed all the fuzz and lint. These lint removing tools make cleaning and maintaining fabrics throughout my home and in my car a lot easier for me and my family. Thank you for reading this review today. I hope it helps you choose the best lint removers for your home, too. Click here to see more reviews of products that will make your home cleaner and more comfortable for you and your family. I thank you so much for this advice..